Clean water is only part of the story in bringing lasting health changes to rural communities. To achieve the greatest health benefits, improvements in sanitation and hygiene must be made alongside access to clean water. These three disciplines—Water Access, Sanitation, and Hygiene—commonly referred to as “WASH,” can virtually eliminate waterborne diseases. The three components of WASH are grouped together because of their interdependence; one cannot be fully realized without the other. Learn more about the UN Sustainable Development Goals and WASH. Teaching sanitation and hygiene habits helps to ensure that communities can continue to make progress and maintain clean water after organizations leave and programs end. According to 2015 data, 11.4% of the world lacks a basic level of safe drinking water, meaning they’re drinking water exposed to harmful pathogens or they’re walking far distances to access safe water. Clean water and health means families are stronger, with more saved income that they can spend on education, business investments, and making a way out of poverty. Read the 2018 Global Poverty Report. A student fills his cup of clean water in Uganda. 12% of the world’s population is still practicing open defecation, which is directly linked to increased illness and even death among communities. Safe water cannot be realized when human feces are in open fields, along roads, or anywhere where humans interact. Feces often contain dangerous pathogens that can make people sick, and children are especially suseptible. This is why the sanitation component of WASH strategies, which are designed to separate people from feces, are imperative to community health. A young boy uses the restroom in his newly-built facility in Cambodia. Education is particularly impacted by quality restroom facilities. In Uganda, all Lifewater school sanitary facilities are accessible for persons with disabilities, and girls’ latrines are constructed to ensure an ideal facility for female menstrual hygiene requirements. Communities with safe restrooms can thrive. For example, after Lifewater constructed restrooms and a well at Bulumba Primary School, the pupil population grew from 1,029 to 1,250 in just one month. The hygiene portion of WASH programs focuses on implementing healthy habits in communities where they are not practiced, or where they are not commonly practiced. These changes in a family’s daily routine have saved lives all over the world. These are simple practices that cost little to nothing, like washing hands, using a drying rack for dishes, and keeping the area around their home clean. 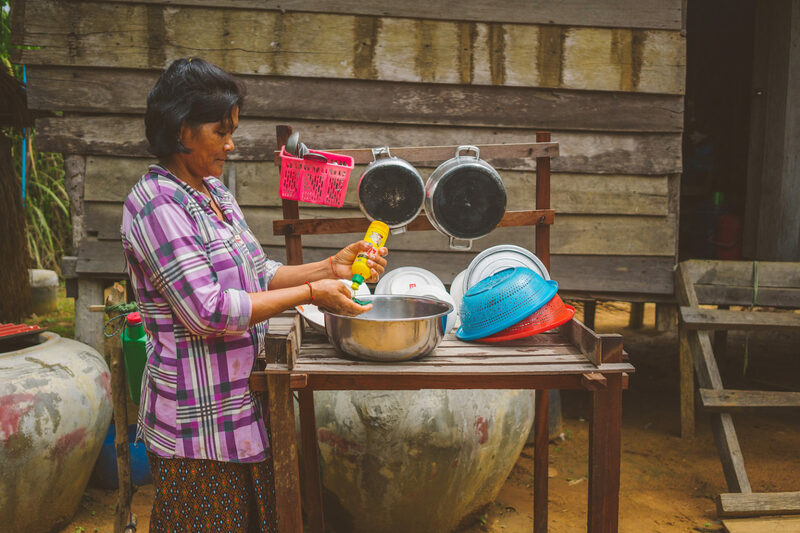 In Cambodia, a woman washes her dishes with soap and sets them on her drying rack. Without hygiene practices and sanitation facilities, safe water is exposed to pathogens that can make people sick. Lifewater’s approach to solving the water crisis is called Vision of a Healthy Village. It is the culmination of 40 years of WASH experience and exhaustive research. By training local leaders who are eager to reach their neighbors with healthy messages, communities take ownership of their own transformation. These health messages fall into five main categories. Handwashing. Washing hands with soap stops the spread of disease. People build simple handwashing devices that save water and lives. Drinking and Storing Safe Water. Clean water stored in dirty containers becomes unsafe water. Families learn to keep water safe from collection to consumption. Drying Rack. Washing dishes and drying them in the sun, away from animals, helps stop the spread of harmful pathogens. Using a Latrine. Building and using a simple latrine separates people from poop, drastically decreasing waterborne diseases. It also provides safety and dignity. Clean Compound. Keeping the household environment clear of trash and feces discourages germs, keeps people safer, and helps them take more pride in their home. Water, sanitation, and hygiene practices all serve to help communities realize greater health and a more complete understanding of their God-given dignity and their own ability to thrive. Community members meet for church in Ethiopia. WASH habits build unity among neighbors in a community. When people aren’t walking for safe water, they have more time to do the things they love, like spending time with family, attending school, and going to the local church. The body of Christ is encouraged to love their neighbor by sharing and implementing health practices; in this way, the church becomes an agent of change for communities who are learning to be stewards of their own health. 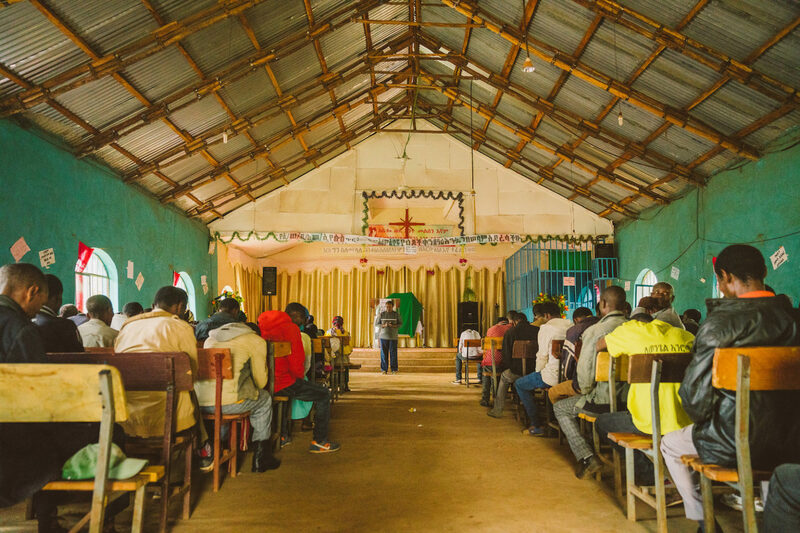 Overall, WASH programs help communities develop a greater realization of their inherent worth, potential, and the plan that God intends for their lives; all of these messages are reinforced throughout WASH training, and the local church is integral to spreading the word. Locally-based businesses are springing up to meet the needs of a healthy community, and they’re sustainable, powerful agents of change in solving the water crisis. Meet Robert, a carpenter in rural Uganda. 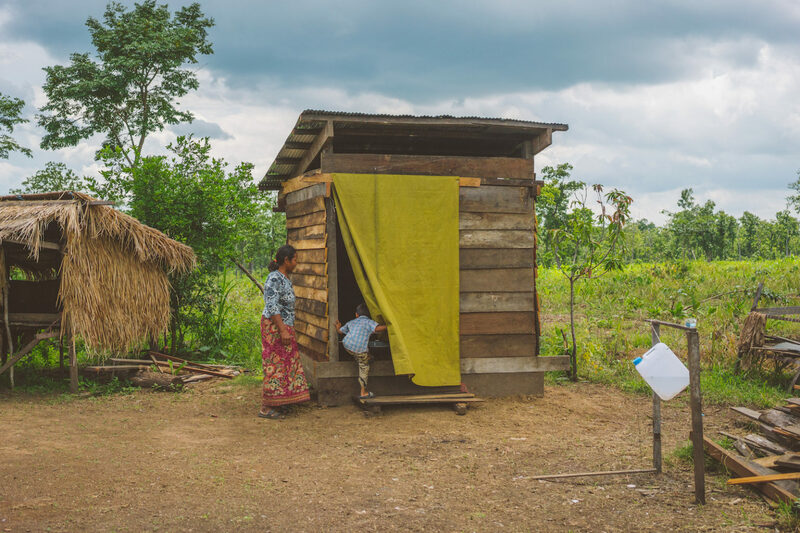 After Lifewater taught the community WASH practices, families needed doors for their “pit latrines.” This is an outhouse that uses little to no water, and to provide safety and dignity, it needs a door and a roof. Robert saw his opportunity, and now, he is busy making doors for the growing number of people who order them. 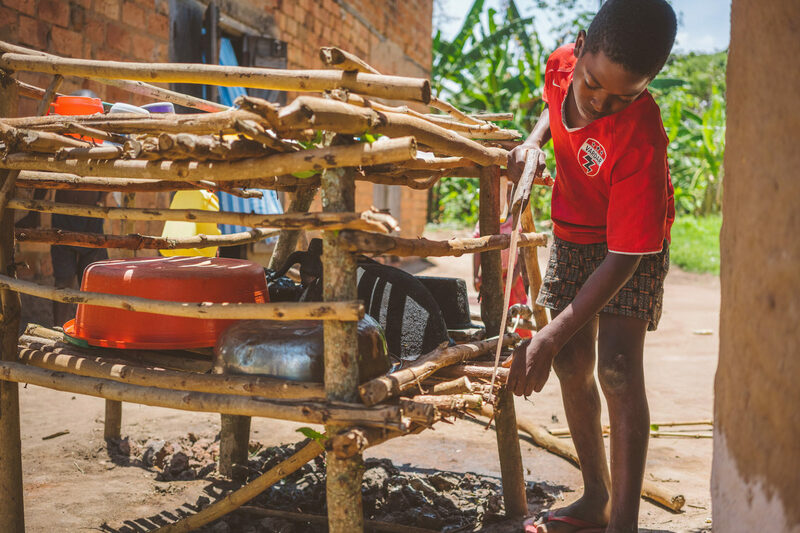 Eleven-year-old Gideon learned how to craft “tippy-taps,” and he makes these handwashing devices for his neighbors. He also builds drying racks for clean and sanitary dishware. He uses the profits to invest in his schoolbooks and fees. Gideon inspects the drying rack he built for his neighbor. 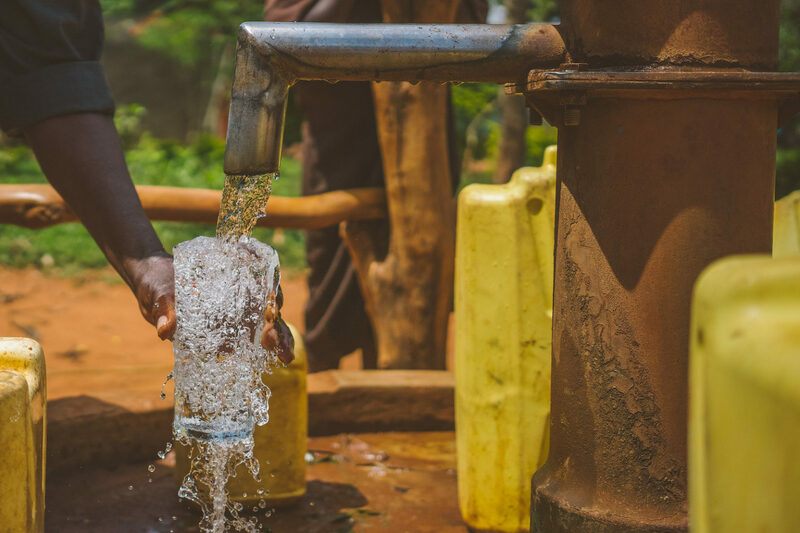 Overcoming the water crisis means that everyone must be involved, from the grandmother enforcing healthy habits in the village, to the children who are eager to learn, to local churches, and to the donors who give generously to make it possible. When we are all walking in partnership with one another, long-term change is realized. The ripple effects of safe water cannot be over-emphasized. While safe water is important, maintaining that water point and taking ownership of it for generations is how solving the water crisis becomes a reality. When a village practices hygiene, sanitation, and safe water use consistently and intentionally, they own their own progress, a progress that touches every part of their lives and advances future generations. Lifewater monitors villages at the household level for five years after program completion to ensure that WASH practices are still widely and frequently practiced. Part of this process included identifying the social structures already at work in a community—like local elders and other neighborhood leadership groups—who will continue to enforce healthy habits for generations to come. With WASH, real community development is possible. Download mWASH Curriculum to learn more.